Us Diabetes Dads had a great ride to Paris, we’ve been back a few weeks now – yes, yes, I’ll do some videos soon. Hopefully some of you managed to follow the fun on our Facebook page – London To Paris Diabetes Dads. Dexcom has generously donated a starter kit for the brand spanking new and shiny Dexcom G6, which 900 of us UK people saw this week on Dexcom’s release webcast. If you’ve already donated to our ride already you can still enter this raffle. What’s the prize and how much is an entry? Up for grabs is one Dexcom G6 starter kit worth £159 (exc VAT), which consists of one G6 transmitter and three sensors. It’s enough for you to trial G6 for 30 days if you use it continuously, or 3 lots of 10 days if you don’t. The transmitter will last longer if you decide to buy more sensors afterwards. The G6 is a vast improvement on any previous Dexcom product, and let’s face it they were pretty damn good. It doesn’t need calibrating, it lasts officially for 10 days, it’s slimmer and its inserter doesn’t scare the daylights out of you. Entry is £5 for one chance. If you wish to have more chances you can – just like you would when buying multiple raffle tickets – you just need to donate multiples of £5 when you enter. NOTE: This is open to UK residents only. Read all this stuff below then head over to our ride’s JustGiving page to enter, see link at bottom of this section. On our Just Giving page donate £5, or multiples of £5 to get more chances. Make sure your name is correctly set up, so that we can announce the winner in July. You will need to go back to the JustGiving site on 20th July to check whether you’ve won. IMPORTANT:Please let me know you’ve entered via Twitter or message me via Faceboook. When is the draw and how will it be done? After the World Cup finishes we will collate a spreadsheet of people who have donated a multiple of £5 between 16th June 2018 and 15th July 2018. If you’ve donated £5 you’ll get one line in the spreadsheet, if you’ve donated £500 🙂 you’ll get 100 lines in the spreadsheet. The winning entry will be chosen by placing each entry into a bowl and chosen at random. The winner’s name will appear on the Just Giving site and here once the draw is over, details should be published by 20th July. PLEASE COME BACK TO CHECK WHETHER YOU’VE WON AS YOU WILL NEED TO CONTACT US TO GIVE US YOUR FULL CONTACT DETAILS. We will pass the details of the winner to Dexcom and they will contact the winner to arrange delivery of the shiny new G6 starter kit. This online ‘raffle’ is legal because JDRF now hold a Small Society Lottery registration with their local council, Islington, it’s reference LN/18477-100518 if you’re interested. To be honest it’s taken us ages to get this licence, and we’d wanted to do this ‘raffle’ before we rode to Paris but getting it right (and legal) was important so we just had to wait until now. But as a bonus the offer is now for a G6. Woohoo. Dexcom has provided us with this chance to increase our fundraising. They want nothing in return and never actually expected us to be in a position to raffle it online, but now of course they’ll get a little marketing in return, but that’s not something they expect. Kudos to Dexcom for helping us with our fundraising and special thanks go to Gerald and John for helping us. Dexcom has also giving us this opportunity knowing full well that half of the Dads on the trip as Nightscouters. It’s refreshing we’re still friends and can talk openly. This article contains the three presentation videos recorded at Children with Diabetes Friends for Life 2015 at Windsor on November 1st 2015. They are available on the Nightscout UK YouTube channel individually, or as a playlist. Here’s an uplifting video previewing the Nightscout conferences taking part in the Fall Autumn of 2015. A moving introduction to Nightscout from Wes and then the ‘What Nightscout Means To Me’ presentations from Kate and Jesus. 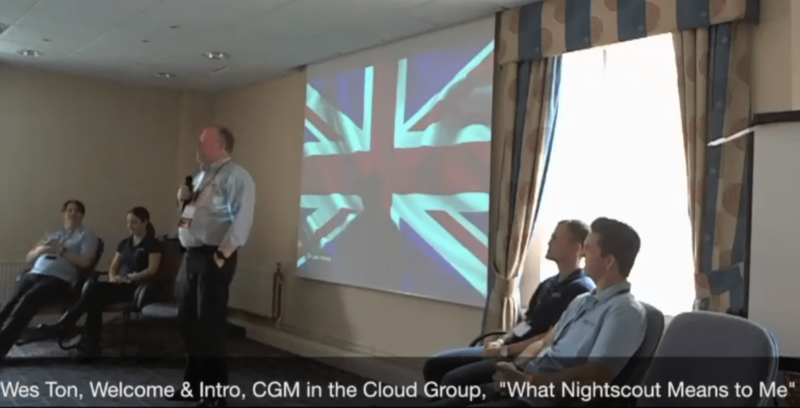 Myself, Tim and Stuart give ‘What Nightscout Means To Me’ presentations. 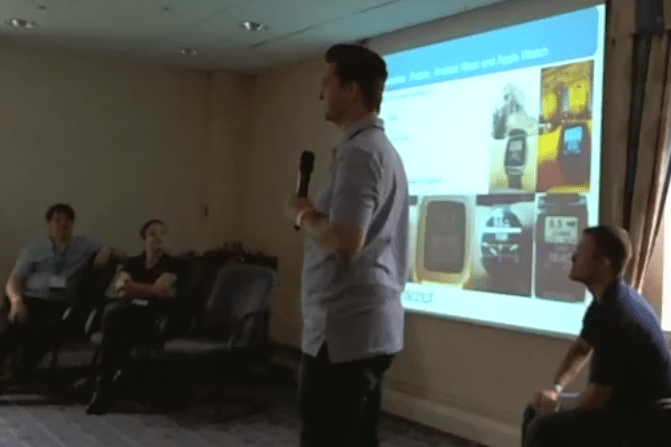 Kate introduces Nightscout web pages, apps and CarePortal, Stuart introduces the advanced options, I introduce the reporting options, then take the mick out of Wes’s Apple Watch a little before reminding everyone that Nightscout is DIY, no-one will do it for you. 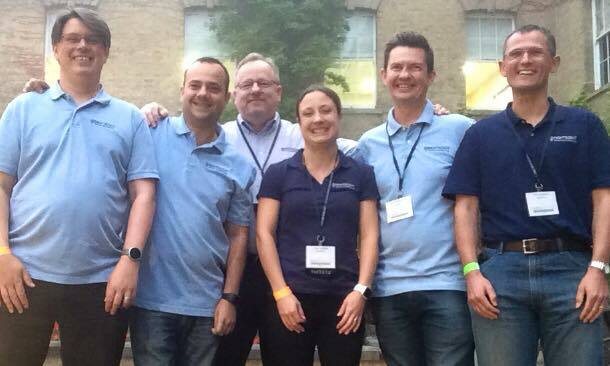 Back in September Wes from the USA based Nightscout Foundation gave me the honour (yep Wes, there’s a ‘u’ in honour 🙂 ) of asking me to join a faculty team they were having at the Children With Diabetes Friends For Life UK conference which took place last weekend. Wes was gathering a team of Nightscout and xDrip users together with the aim of showing families what Nightscout does for us. And so the team was formed with me, Wes, along with Stuart and Kate whose kids have Type1, and Tim and Jesus who both have Type 1 themselves. Jesus is somewhat of a God (bet that joke hasn’t been said before eh Jesus?) in the community and flew over from Spain for the weekend. 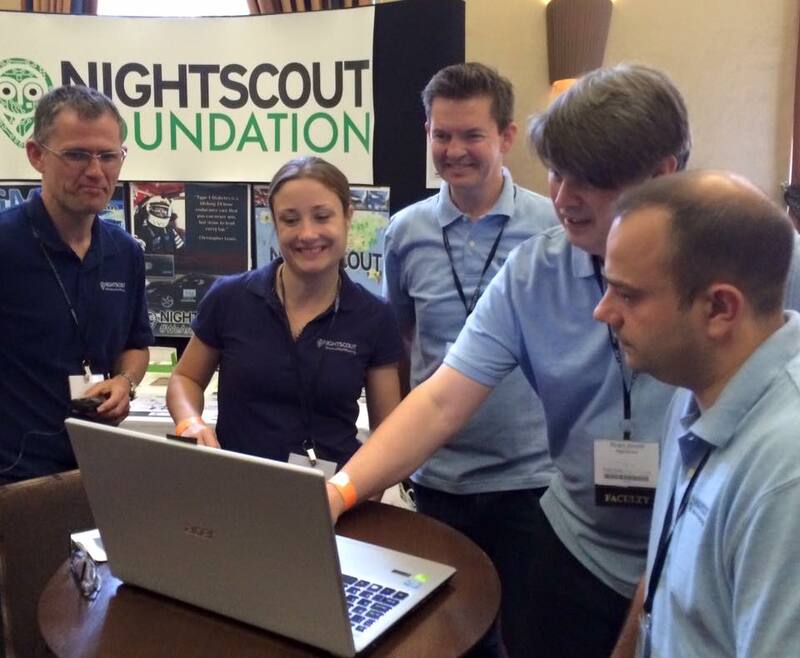 Then Wes dropped the bombshell, he wanted us to present Nightscout, not just give 1-1 advice and info at a stand. Present! What? Me? “Erm, okay” I said very tentatively. Being on holiday for the Saturday I could sadly only attend the Sunday but the planets aligned as that was the day the presentations were (“Oh great!”). At 5am the alarm sounded. I present often at work and am somewhat reknowned for having whizzy slides full of colour, animation and more importantly eye-distracting graphics which take the focus off of me, but I had a problem as I would have no time to prepare anything as I was on holiday. So at 5am on the Sunday I woke in panic and managed to cobble stuff together and from there on in I felt relaxed, I had a plan, I had slides, I was ready. None of us had met before but after arriving at Windsor and meeting everyone I felt like this was a team which had been together many times, we were so relaxed together, sharing jokes, poking fun, and just understanding everything each other was talking about. Our first task was to decide who was doing which bits and I found myself volunteering for a lot more than I thought I would. Perhaps I wasn’t so nervous after all. Wes posted a photo: we were no longer anonymous. The morning session wasn’t advertised in the programme, just on flyers at our stand so we had less than 20 people there, but that was great for my first foray into public speaking. I’ve always felt that if anything I say or write opens the eyes of just one family then I’ve done my job because I know that family will open the eyes of another. Due to enthusiastically overrunning our slide timing the session really turned into a What Nightscout Means To Us presentation. Wes opened the presentation with a heartfelt introduction to Nightscout and what it mean for him, it was very moving, speaking about how his son’s T1 diagnosis at 12 months affected the family. Kate spoke about how Nightscout “makes the diference” and spoke of how the “glanceability” of her glucose readings on a watch reflects what her driving instructor told her “nothing should ever come as a surprise in your rear view mirror”, she’s aware of what’s happening before it escalates into a difficult to deal with hypo or hyper. Jesus’s story to me is amazing. He’s a parent but he is the T1 and he developed software for himself to monitor glucose readings. 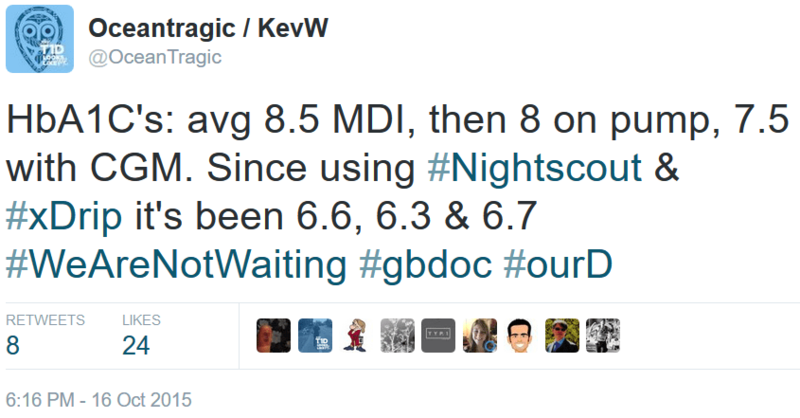 One day he heard John Costik’s Nightscout story and within an hour sent him an email to let him know that Jesus could get readings from Medtronic Veo CGM and could amend it to work with Nightscout. I can’t begin to tell you how moved I was by Jesus’s story of selflessness. Stuart spoke about how Nightscout lets him know “at a glance whether to react or relax”, which along with Kate’s “glanceability” sum up Nightscout very well for me. With his daughter being 13 she is starting to manage her own diabetes and diabetes allows Stuart and his wife to pull away more and only intervene when required, meaning his daughter finds it less intrusive. When my turn to speak arose I felt calm, I just wanted to get my story out there, I was somewhat surprised I wasn’t a bag of nerves. I spoke about how to a teenager almost nothing was more than important the weekend lie-ins and that Nightscout means I’m not worried about whether she’s too low or too high when her bedroom door is closed till noon. “BG’s are not as important as Snapchat and 5 Seconds of Summer” was my next line. Amy wants to be a teenager and do teenagery stuff like listening to her music and chatting online with friends, probably about the music they’re listening too…and boys…and boys who are in bands…like 5SOS. I mentioned that whilst cooking I can glance at my watch and decide whether I need to intrude on Amy to ask for an early BG check so we can pre-bolus, or adjust to get her at the lower end of her range before eating. Like Stuart’s daughter this is less intrusive for Amy than before Nightscout. I explained how I use Nightscout to “nudge” Amy. With my range set from 3.5-14mmol and Amy’s set from 4-9mmol (her choice) I know that she would have had an alarm if over 9 but if she reaches 13 for example it’s probably because she’s not noticed an alarm, so I give her a gentle nudge to do a check or make an adjustment. 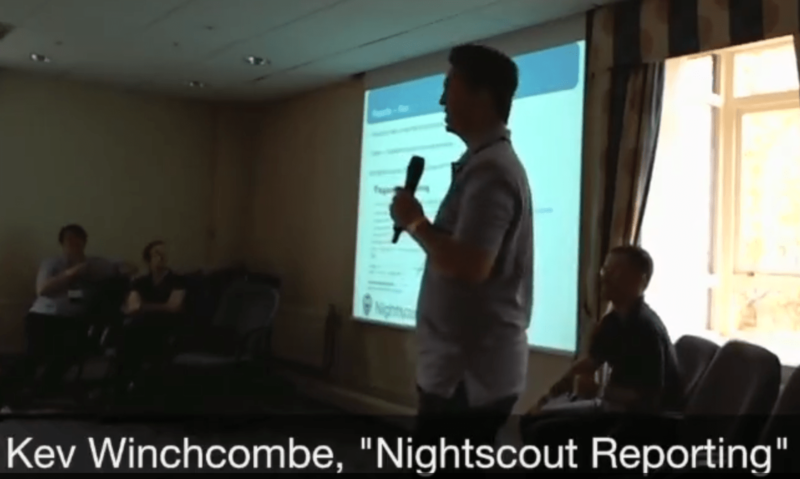 Kate went into the basics of Nightscout, the website, the browsers and phones and what appears on the screens and gave an overview of CarePortal. CarePortal is where kids and school carers/nurses can enter information about carbs, insulin and many other things into Nightscout which can then immediately be seen by the parent/carer, which in turn means that worries about Hypers may be negated if the parent can see insulin has been given, meaning in turn no panicky phone calls to school. Stuart expanded on this talking about the ‘pills’ which appear on the screen and show you values such as Insulin On Board, Carbs On Board, and the Bolus Wizard Preview, which based on settings you’ve entered gives you an idea what sort of action might be required to get the child back in range. Stuart stressed that this is only for an idea of what to do and shouldn’t be used without deciding on whether that action is appropriate or not. I presented about the reports Nightscout gives, comparing them favourably to Diasend which I rarely use now. One report gives you an estimation of A1c and ours said 6.8% prior to the last clinic when Amy got her 6.7% result. Just for fun us Pebble watch users decided to do a speed test with Wes and his Apple Watch, to see how quick we could all glance out our kids’ glucose level. It took Wes a fair bit or time. Finally, it was lunch time, and as the engaged audience left the room I knew the team had done a good job and we eagerly awaited the afternoon session which would include presenting solutions and a workshop where we could solder some bits or help get people going with their Nightscout solutions. Andrew Abramowicz wanted to take his xDrip to the next level, so he made another one with inductive charging using the Qi wireless receiver module from Adafruit. 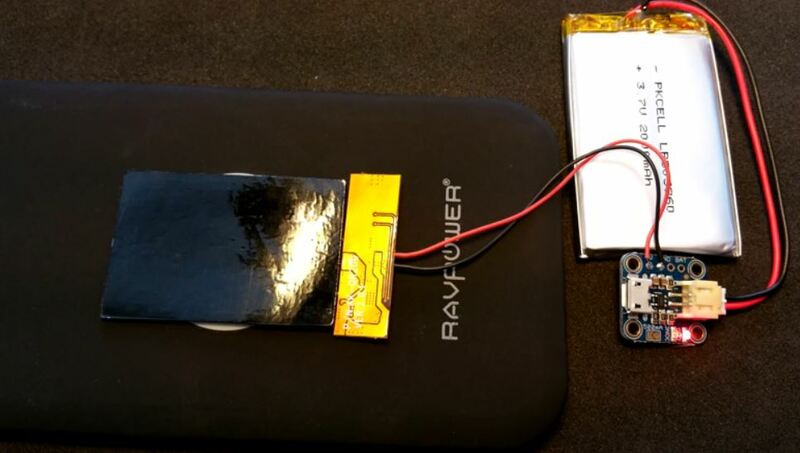 He increased his battery size to 2000mAh which is roughly the same size as the charging module, which is a little on the delicate side. A few weeks ago on the 18th June Amy inserted her first CGM sensor. On the 12th July she took it off. Initially it was very exciting seeing how accurate Dexcom was in comparison to Amy’s normal finger-stick checks, seeing those graphs, flipping between 1 hour graphs, 3 hours, 6, 12, 24. Then it felt scary: how high she had gone after a meal, how high during the night, the fast dropping blood glucose levels, the lows after school. Then it felt like we could put this information to use and start to alter Amy’s basal/background insulin levels. That is after all one of the key reasons we got it. The red line is the level where Amy will get alerted that she’s ‘high’, we’ve set it at 13.3mmol/L. The blue line is the level where Amy will get alerts that she’s ‘low’, we’ve set it at 4.4mmol/L. The dotted green line is her CGM trace which believe me doesn’t often look that flat, it’s more like a section of the alps or England’s rolling hills. So in the blink of an eye you can see it’s 13:56 and Amy is currently 6.7mmol/L and rising, steadily, because at 1pm (one yellow mark from the right) having slept in really (really) late she woke up and had lunch 30 minutes later. Some graphs don’t initially look very good at all, but they are as they’re always opportunities for learning. Take the one on the right, it’s a graph of us experimenting with eating a Chicken Xacuti curry and rice and giving a combo-bolus on the pump of 60% of the insulin immediately and the remaining 40% over 2.5 hours. It tells us a lot…don’t eat rice (joke). From the graph we can tell that need to give less insulin up front so we’ll probably try a 40%/60% next time. We know this because she started at 6.5mmol/L and dropped to 3mmol/L(ish) within the first 90 minutes. Unfortunately the previous graph isn’t too much use because at that time Amy’s basal/background insulin was wrong and her levels were high from 10pm until about 4am. That looks all very confusing but the two key things look at are the green bar (which is the magic zone of between 4mmol/L and 8mmol/L) and the red line which shows the average blood glucose levels for each particular time of the day. It tell us we have a problem: she’s rarely in that magic range, her average is too high, she needs more basal/background insulin. Deciding to focus on the night time of 10pm to 8am we didn’t do any changes to her basal profile for two weeks as we wanted to discuss the CGM results with the nurse at clinic. We all agreed on the changes required and then watched the next few nights’ graphs, making some tweaks here and there, before finally getting the graph below, although we’ll make sure she’s a little higher when she goes to bed from now on.